The WHC Workbook is here! This printed book contains all the material for Basic Practices 1-12 as well as Exercises for each practice and a section called “Questions, Answers, Reflections and Discoveries”. 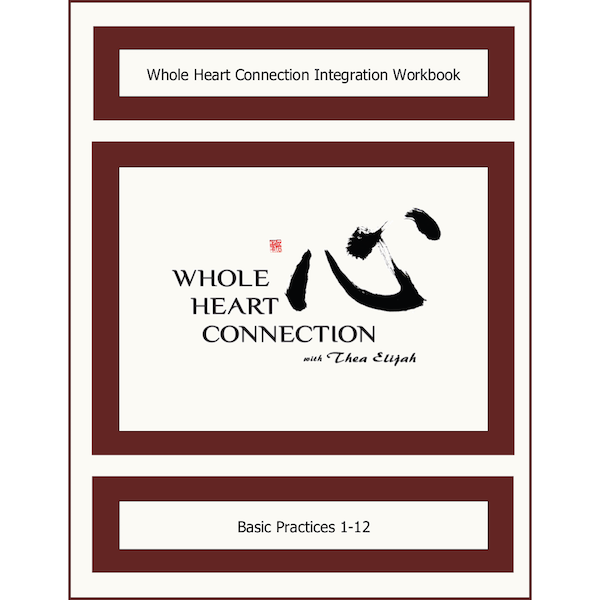 This workbook is primarily designed to be used by students who have already taken a Whole Heart Connection Intro class. You are welcome to explore the workbook on its own, but please remember that words on a page are no substitute for the embodied experience of a group of people practicing together. Consider coming to a class! –Copying and/or distributing of any portion of Whole Heart Connection Integration Workbook must include acknowledgement of Thea Elijah as the author of the material, and the acknowledgement must include the website www.perennialmedicine.com. –You must not copy and/or distribute any portion of Whole Heart Connection Integration Workbook for personal financial gain. –Modification and distribution of this material is permitted only by written consent of Thea Elijah. –Copying and/or distributing whole chapters or large portions of Whole Heart Connection Integration Workbook is not allowed, unless by written permission of Thea Elijah. Once your purchase it complete, you will receive an email with links to the PDF workbook and the audio files. If you have any questions please email info@perennialmedicine.com before purchasing. By clicking the “Add to Cart” button, I acknowledge I have read and understand the above copyright policy. Please be sure your address is correct upon checkout. This is where we will send your Workbook.